Twitter has invented or at least introduced real-time communication as mass phenomenon. Until a few months ago Twitter dominated the marketplace for real-time communication. Google as well as facebook considered to acquire the start-up but Evan Williams, Biz Stone and Jack Dorsey wanted to make their own way and forced Google, facebook and Microsoft to do their own real-time projects. And they did. Google just recently launched its real-time Communication platform Google Wave and its real-time search feature (in partnership with Twitter and facebook). Google has grabbed the lead in real-time search, and it appears that Facebook and Twitter have both conceded that they aren’t going to attack Google when it comes to search. Google will definitely dominate the social-search market as facebook will dominate the social network market. Twitter has given up a powerfull position. And worse: Top Twitter like user criticize Twitter for it’s incapability to innovate. ReadWriteWeb has named Twitters lack of innovation as one of the Top Failures 2009. I’m having flashbacks to the Browser wars during the late 1990s. You remember? In 1995 Marc Andreessen and his company Netscape Communication Corporation invented with Netscape Navigator a completely new browser that incubated the new Web. 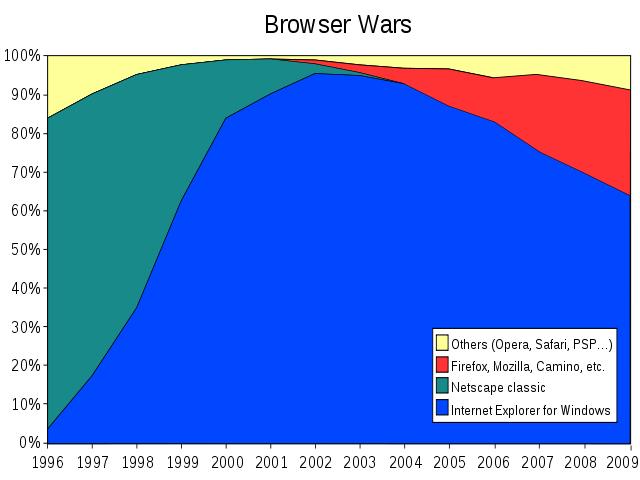 In 1995 Netscape Navigator was the most widely used web browser with a market share of around 80%. Backed by this success story Netscape made a very successful IPO on August 9, 1995. The stock was offered at $28 per share and soared to $75 on the first day of trading. Netscape’s success landed Andreessen, barefoot, on the cover of Time Magazine. Back in 1995 no one was interested in old fashioned Microsoft that just had overthrown IBM as the world’s number 1 technology company. But Netscape’s Navigator represented a huge threat to the future of Windows and Microsoft. The Web quite obviously was the promised land for PC users. And the browser is the gatekeeper into this promised land. Whoever controls the browser controls the PC- users. Bill Gates and Microsoft decided to absorb the browser business the unfriendly way. They integrated the Internet Explorer into Windows. IE 1.0 was released as part of the Microsoft Windows 95 in August 1995. IE 2.0 was released as a free download three months later. Unlike Netscape Navigator it was available to all Windows users for free, even for commercial companies. Within a few months the shooting star Netscape was more or less sentenced to death by Microsoft. Netscape could not compete with this Microsoft’s “free give away” strategy. They lost their economic basis. Microsoft on the other hand conquered the market: from nearly zero in 1995 to roughly 95% market share in 2003.